If a driver starts off as abit erratic, crashing, making silly errors etc, but learns from this experience and adapts his driving style, is your judgement of this driver still affected by his early career or when can he be taken seriously as a potential race winner / WDC. Most people's opinion of Massa come from his season with Sauber when he was an erratic driver, and didn't believe he could challenge for the title this year, almost everybody considered Kimi to be the main challenger, dismissing felipe as a No2 driver..
at Ferrari, Felipe has transformed himself into a race winner/ nearly WD Champ (with a little help from schumi), but when will people stop thinking of Massa as the erratic sauber driver and take him seriously. We didn't expect Felipe to be the main ferrari challenger, so has he shook off the 'underdog' tag, and is he now rated as highly as Kimi, Lewis, Kubica, Vettel.... ? I still think Massa is erratic - he just makes fewer mistakes. And his team has made more mistakes - perhaps this has rubbed off of Massa onto his team. I still think Massa is unstoppable from pole. When he's out infront he can pull away from his rivals, it was the same last season. I think problems begin to appear when he's a bit further back, I don't believe he can overtake and this causes his silly mistakes. It wasn't just his mistakes in his Sauber days, but mistakes he made in the first 2 years at Ferrari helped forge peoples opinion of him. This year he's done alot to shake that reputation but I still believe he needs to show he can pass his rivals on track. Even when he has a problem and ends up on the back of the grid, he passes the slower cars, but mainly due to the performance difference in the car. Look at Singapore, after the pit lane incedent his confidence dropped and he couldn't pass anyone, but there isn't many places where the performance advantage makes it easy to pass. I think drivers can change for the better (or worse!) what I think is often more difficult to do is shift peoples perceptions. For example Jean Alesi had a reputation for doing silly things - one he worked hard at establishing. The reputation endured, but the reality was long before the end of his career he was one of the most consistent drivers in F1.In fact if I recall correctly he would have finished every race in his final season if a drunk Finn hadn't spun in front of him in Suzuka. Felipe will not have won over all the critics yet.Its human nature to select the evidence to fit our view of things so for example the critics will mention Silverstone to say he can't drive in the rain.But the win in Interlagos and the third place in Monaco show he can't be too bad.He also nailed the idea he couldn't do street circuits in both Monaco and Valencia. All he needs to do now is qualify down the back and win a race.Which is unlikely given his qualifying form. Nobody really rated Damon Hill either and he wasn't bad, just a little lacking in race craft. quite right Murray even in Estoril 1984 Mansells last race for Lotus, he tested two type of brakes & he wanted the new type saying the brakes would not last the distance. Just that we all missed the part from Ralf went from being mediocre to the best 3 drivers in F1. I had forgotten about Ralf. He did go from being rubbish and constantly falling off the track to rubbish and staying on the track. Mostly. By doing that he became the 3rd best driver! In fairness to Ralf, he was good on his day. He was just another of those drivers who's good days didn't come often enough. 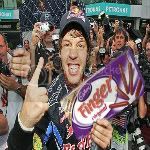 When he started in F1 he was not good. Frequently he spun off or took someone out. He did improve on this over the first couple of seasons though. Tad Comfy wrote: Sato anyone? Sorry. I missed this. Sato improved out of all recognition during his time in F1 IMO. In his Jordan days, he was usually quick but extremely accident prone. Yet last year, he drove some fantastic races for Super aguri and no doubt would have done this year too if his team had been able to continue. Anyway, what's with the name change, Mr Comfy?